This post is sponsored by Better Homes and Gardens at Walmart all opinions are 100% mine. This post may contain affiliate links. For more information see my disclosure policy. Every time we move it’s like a mad dash to unpack boxes. 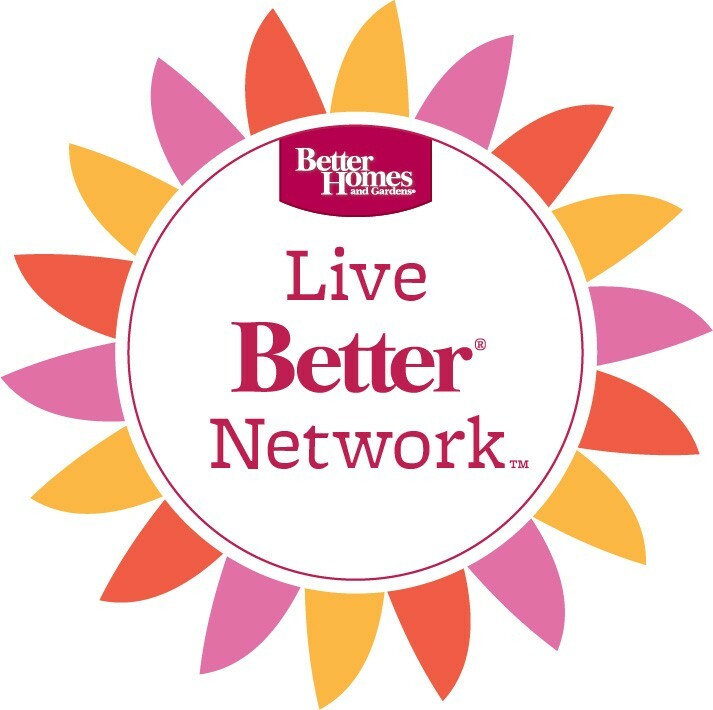 I hate living in chaos and it seems like the months leading up to a move are so chaotic that once we finally arrive to our new destination – I want to get unpacked fast. I even like to do a little decorating as I go. Remember when I did a “summer home tour” only a week after moving in to our new Florida house? Sometimes, it’s great to have a bit of calm amongst the sea of boxes and packing paper. 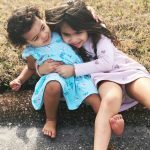 I’m not sure if I’m completely insane or if this is how everyone rolls but I’ve learned over the years – pulling it together quickly keeps you sane. 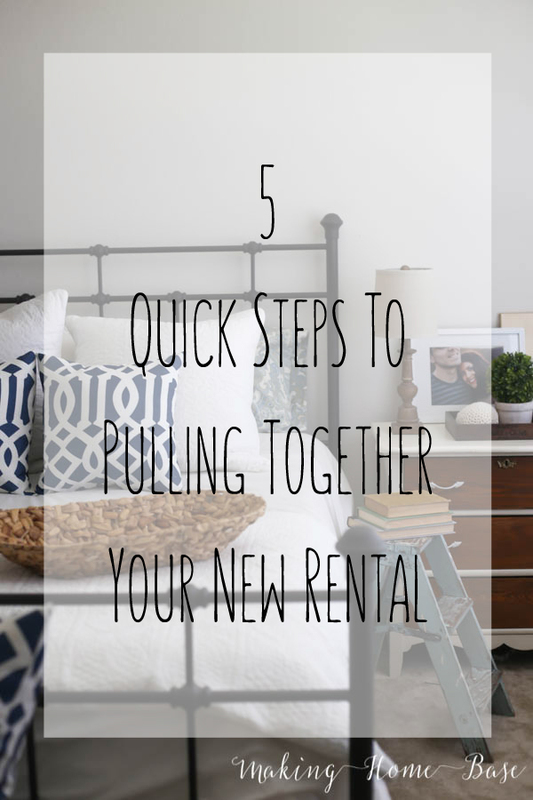 Since I’m a self proclaimed moving professional at this point, I thought it would be fun to share my 5 tips to quickly pulling together a space in your new rental. I’m using our current bedroom as an example for decorating a new rental space. When we first moved in the only thing in this space was the bed, mattress and nightstand on the right. I really should have taken a before picture – but you can imagine – very bare. Step 1 – Dress Your Space. This may seem like a no brainer when it comes to pulling your space together quickly but it makes a world of difference. 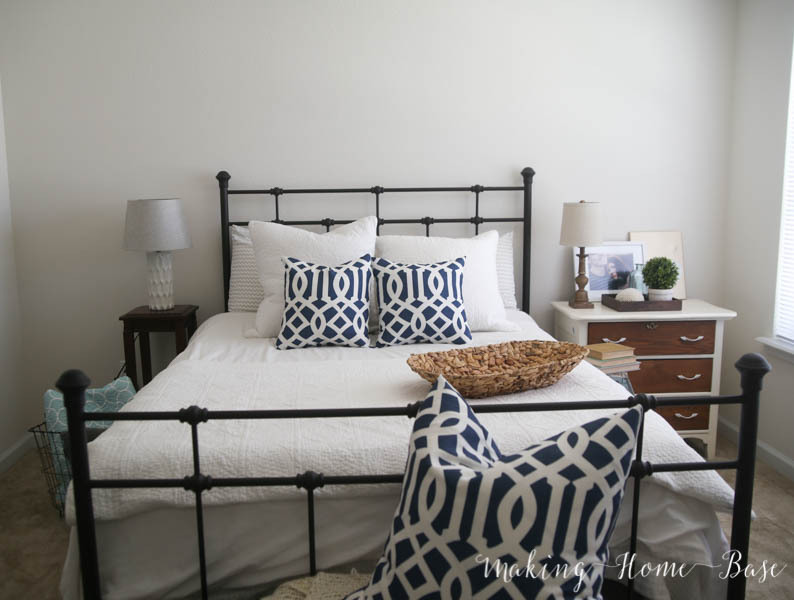 Great bedding with some throw pillows immediately makes your space feel polished, even if you have nothing else in the room. 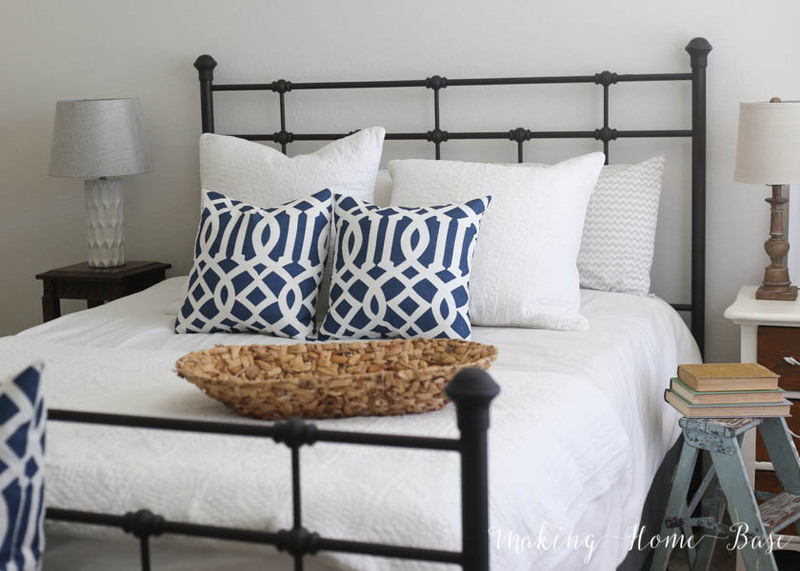 I love white bedding because it’s so easy to bring color in and change things up. 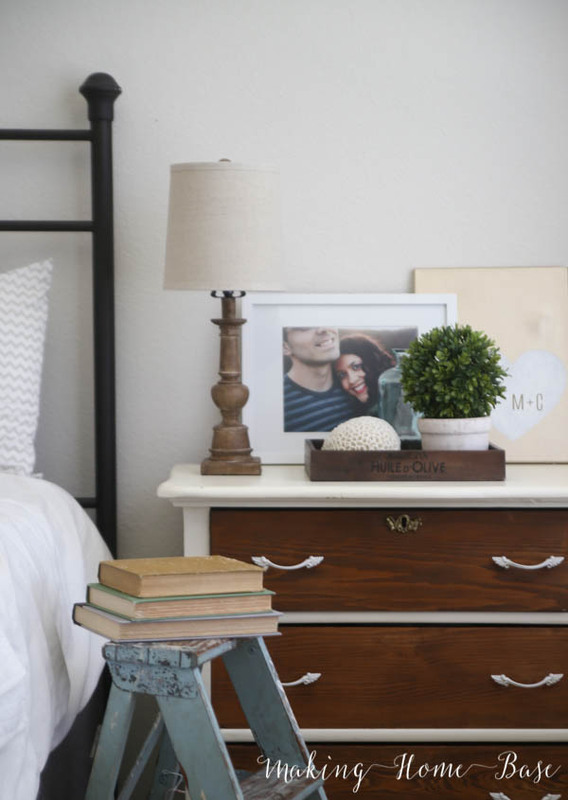 Step 2 – Personalize your space. If you want to pull together your rental space, quickly, one huge piece of that is bringing in bits of YOU. It’s so difficult sometimes to make a rental feel like home. Whether your are in a dorm, an apartment, or a rental house – they all come with challenges. Putting your mark on it helps to pull it together. I’ve said it before and I’ll say it again, I love doing this by using family photos. I love filling these white frames from Walmart.com with photos of our family and accessorizing with them. Step 3 – Bring the outdoors in with some greenery. From the tiniest potted plant, to the most beautiful fiddle fig, having some greenery in your rental space will immediately make it feel more homey. It will also bring you some sanity if you live in a space that has a limited outdoor living area. Step 4 – Use your own light. It almost always happens that rentals have the worst lighting. We lucked out recently and have a ceiling/light combo in every bedroom of our new house. 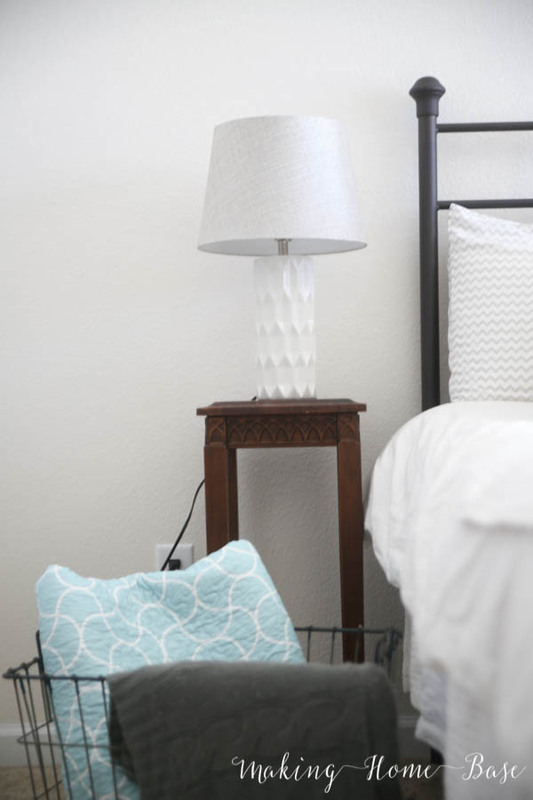 Still, having some beautiful table lamps not only allow you to bring more light in, they are also just great accessories to your rental space. 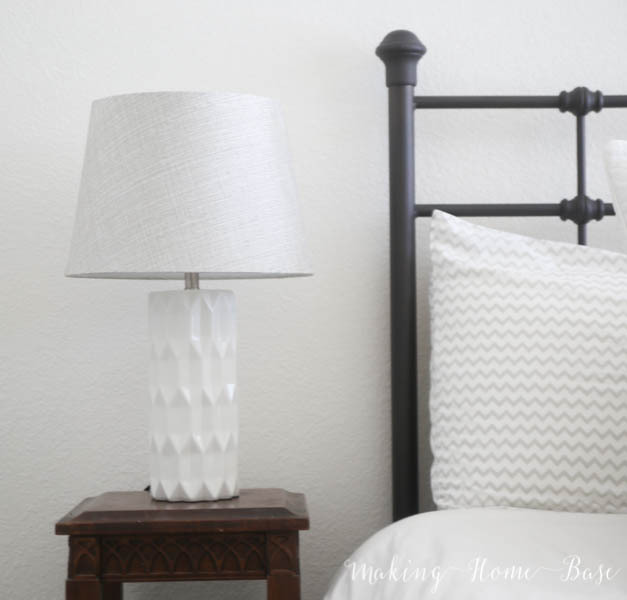 This lamp with the shimmery gray shade is perfect in our bedroom space. It’s just another opportunity to personalize the new space to your taste without breaking the bank. Step 5 – Use what you have. It never fails that every time we move into a new rental space items get shifted from room to room. There’s nothing better than shopping your own house. This little ladder has been floating around our house since we moved in before it finally found a home next to our bed to hold books and such. The same goes for this pedestal table that I’m currently using a bedside table. And you might recognize that blue quilt in the basket next to the bed. It’s the same colorful quilt I used on the bed during the spring and it’s now rolled up displaying the opposite side for a more calmer coastal feel. I love being able to use and reuse pieces from place to place. 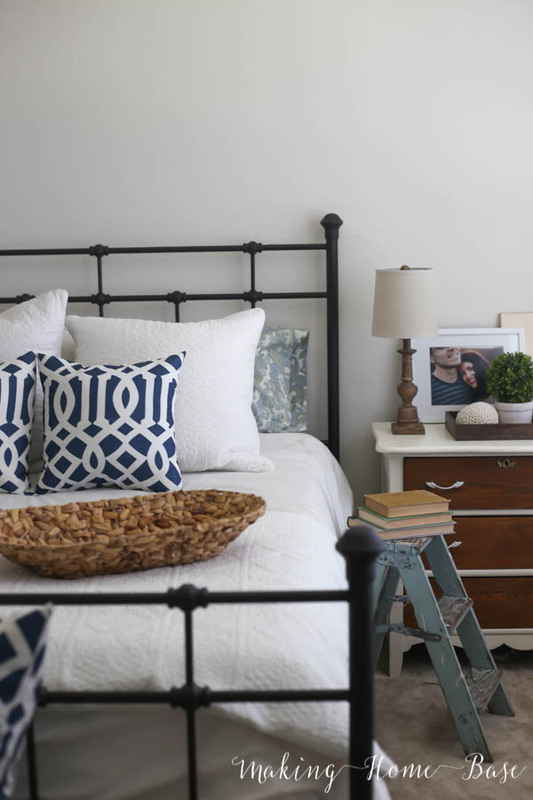 So there you have it – a quickly pulled together space that is completely budget friendly. 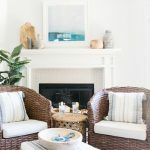 For me, decorating a home is always a journey so nothing ever comes together overnight. Even this space is still a work in progress for me but I am super proud to say that after living in our home just a few months I was able to quickly pull together this space. What are your tips and tricks for decorating a new space? We are preparing for a move to our first-ever duty station (with 2 preschoolers and a newborn in tow!) so I’m desperate to hear any tips on pulling together a space quickly after moving. This motivated me to try and put at least one room together. I totally agree that even if every other room is overflowing with boxes, having one room in order will help a lot. 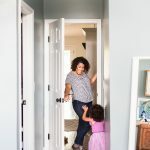 I use this method just when cleaning my house (when not preparing for a move) because if I have one room that is a place of calm, my day goes so much smoother! Beautiful ideas! Doesn’t look like a rental! Such a great room! I have a little ladder like that, except it’s orange. I need to add something to it, thanks for the inspiration! Lovely tips, even for homeowners!